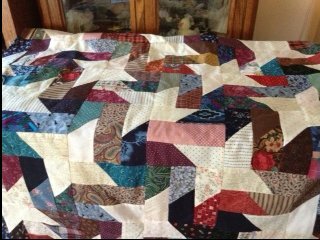 I have been given this quilt to finish for someone and I would love to know the name of it. You will notice that four blocks make a star. There are 3 strips and in each corner there is a light color for the stars. I have looked but can't find it. It is called Picket Fence or Picket Fence Star. Here is a free tutorial on making it with 5 inch charm squares. It is also called Buzz Saw. Thanks for that website -- they have some amazing patterns and tutorials all right there! Thanks for sharing the link, alikigirl. Thanks ladies for getting back to me with the name of the pattern. I knew the board would be able to help. Thanks for the link....it is now on the "list"!! !